Can be used as a tool to pick up glass slides, cover slips, wafers, thin film samples, etc. Double-insulated (115-120V, 60Hz, 2-wire). Light weight, completely assembled and ready for immediate operation as soon as the proper tip is selected and installed. Vacuum is created at the tip by placing the finger over the control hole on the anodized aluminum vacuum pen. To break the vacuum, just remove your finger from the hole. Vacuum Pick-up System complete set: Vacuum Generator, Aluminum Vacuum Pen, Five Vacuum Tips, Set of seven Rubber Vacuum Cups (size ranging: 9/16", ½", 7/16", ⅜", 5/16", ¼" and 3/16"), an In-Line Filter, and 4 ft (122 cm) of Vacuum Tubing. Battery-free, hand-held vacuum pick up pen designed for the safe pick-up of SMD components during assembly, test and rework processes. With fountain-pen dimensions, Vampire grabs, lifts and places components in complete safety, aided by a powerful internal piston and a full ESD protection. A complete choice of tips designed for any size of SMD component helps the operator to have always the right tool in hand. Includes: pen, conductive metal straight needle, 45° angled metal needle, conductive rubber cup 4 mm, conductive rubbercup 6 mm, conductive rubber cup 9 mm, and lubricant kit. 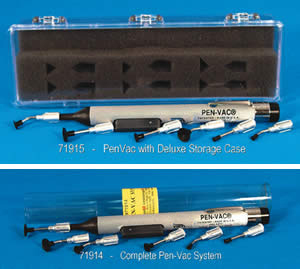 Pen-Vac™ is a new improved way to handle small, flat surface objects. Beside the electronics assembly industry, jewelers, model builders etc. Pen-Vac is ideal for EM work as well. It can be used to handle grids, pick up stubs, align membranes, work with glass slides, cover slips and much more. Holds up to one minute. 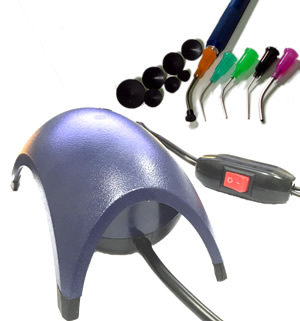 A variety of Vacuum Probes, complete with a vacuum cup attached and it is available with plastic or aluminum hubs. Straight and angled to suit your applications. The stainless steel needle portion of the probes are one-half inch long. Vacuum Cups come in a wide range of materials. We offer the Static Dissipative and the Conductive Cups that provide ESD protection for electrostatic discharge of sensitive components. Cups comes in three sizes: ⅛" (3.17 mm); ¼" (6.35 mm); and ⅜" (9.52 mm). One Pen with 6 Probes and Cups. (6 Probes: 3 angled ⅛", ¼", ⅜" and 3 straight ⅛", ¼", ⅜"). 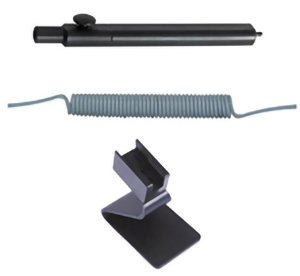 The Porta-Wand kit comes with a non-removable 9.6V NiMH rechargeable battery and in-stand charger. Easy push-button on/off control. Replaceable internal air filter is accessible from the front of the tool. Internal exhaust filter ensures better than Class 1 performance. Indicator Light flashes when battery needs to be recharged, and also turn on when proper vacuum has been established. 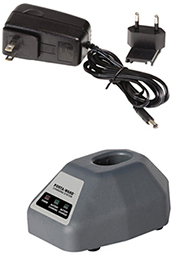 Charger Power Requirements Supplied In-Stand Charger; Wall plug-in power supply 24 VDC @ 500ma. Barrel jack size 5.5 mm OD x 2.1 mm ID. Center pin positive. The Porta-Vac II kit comes complete with a disposable 9V battery and a wafer tip. A large switch provides easy on/off control. The internal air filter is accessable from the front of the tool, and an internal exhaust filter ensures better than Class 1 performance. Optional rechargeable battery and in-stand charger also available. ExP Vacuum Wand Kits are a lower cost alternative to the Porta-Wand and Porta-Vac II systems, which share the same tips. Has a push-button to close the vacuum and release the wafer. The included stand keeps the button pressed when the wand is not in use. Comes complete with an ⅛" Inner Diameter coiled vacuum hose and a wafer tip. Must use a vacuum pump or vacuum line. Able to be used with our Vacuum Pick Up System. Made from PEEK, a high performance plastic and are able to be used in Porta-Wand, Porta-Vac II, and EMS Vacuum Wand Kits. Withstand temperatures up to 100°C. Thin profile to allow easy access to wafers. Made from hard anodized aluminum, these wafer tips are able to be used in the Porta-Wand, Porta-Vac II and EMS Vacuum Wand Kits. Withstand high temperatures up to 250°C. They feature a 3" long, straight stainless steel tube covered by a PTFE sleeve. The press-fit adapter is made from static dissapative plastic. The Handi-Vac®-2 has an improved tip designed for better lifting capacity utilizing larger, non-marking vacuum cups. This new tip also enhances functionality and improves accuracy when picking and placing parts. It can be purchased with one static-dissipative cup available in three sizes: ⅜", ½" and ⅝". The entire vacuum tool is ESD-safe. 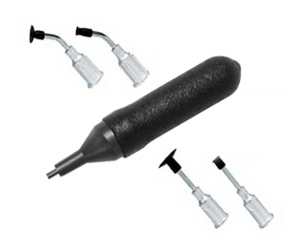 The Handi-Vac® Squeeze Bulb Kit is a versatile, cost-effective vacuum tool system that should be on every tool-bench. This tool can be used with larger rubber vacuum cups ranging in size from 3/32” (2.38 mm) to 3/4” (19.05 mm) in diameter. Use the larger cups to pick up larger and heavier parts by placing them directly on the Handi-Vac tip without using a probe. This portable vacuum anti-static pick-up device is ideal for objects ranging in size from 0.200 to 3.00 square inches. Ground strap recommended to ensure static discharge. Produces discs from sheet materials. Ticket punching type. Comes with adjustable side gauge for centering hole, 2" maximum reach. Weight 10 oz., 6½" long. Maximum thickness for punching is up to 67-mil (1.7 mm). Disc size available: 5/16", ⅜", ½" and 1". Complete unit includes one punch handle and one punching die.